Version 2 of this project worked ok. But the pads tended to hot spot. So much that hits on the edge of any pad did not trigger much at all. 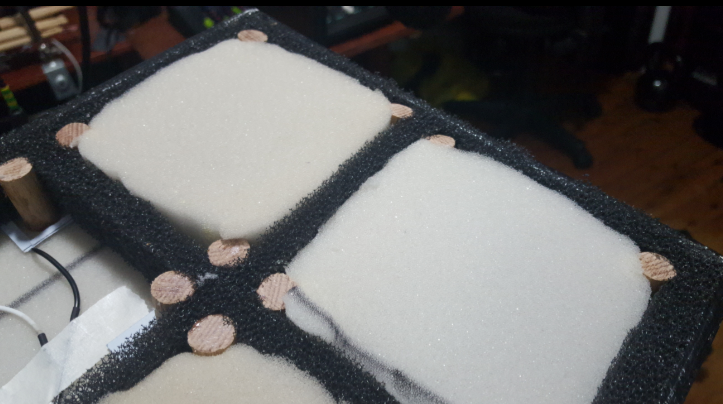 I worked out a better way to do this..
First I cut out some acoustic foam to make 6 voids the size of the pads. 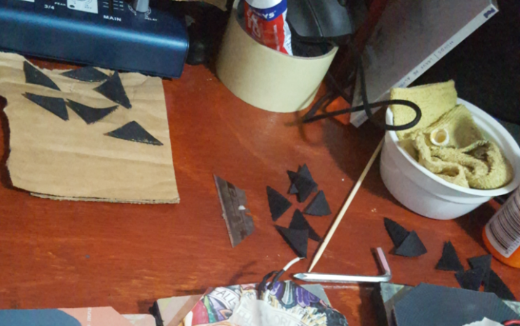 Then I glued together 2 sheets of cardboard (the sort you use for school projects) and cut out the shape you can see in the this image.. 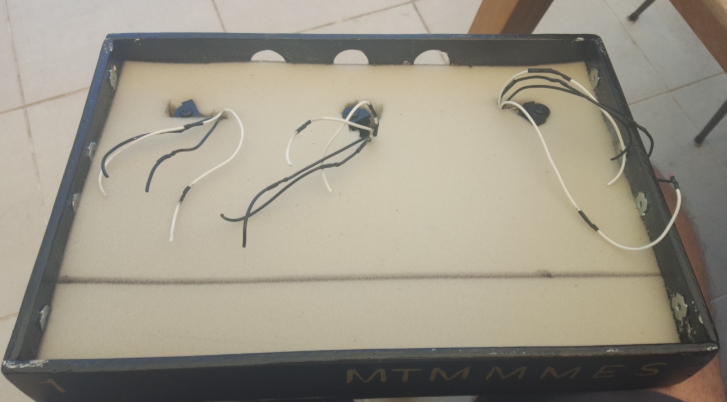 While that dries I go back to the box..
Then I needed move the plugs from the back to underneath. Only possible through the magic of DIY. These plugs do not like being on and off etc and one of them stripped it's thread. I got them tight and epoxyed those too. From the top the box now looks like this before I add the black foam form. Next put the dark foam into the box and I glued wooden dowels that I had cut to length and added 4 to each void. 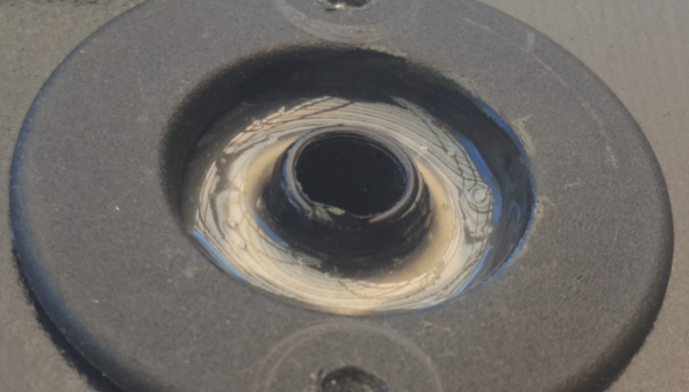 They are glued with epoxy to the yellow foam below and a little near the top of each to the black foam. 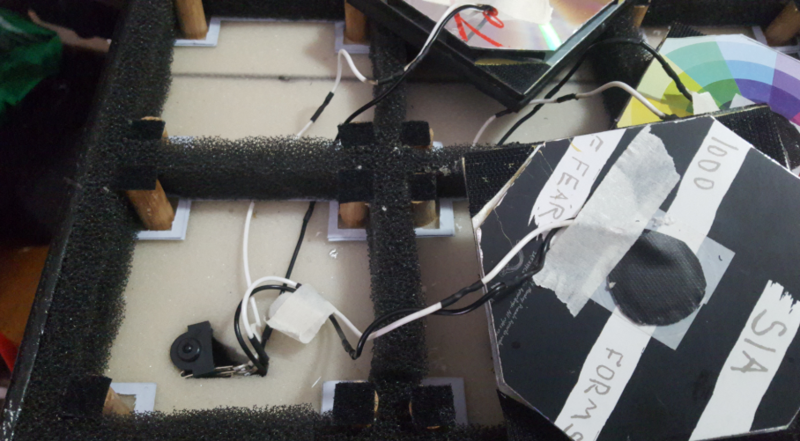 The are not glued to the cardboard that is now under the black foam. 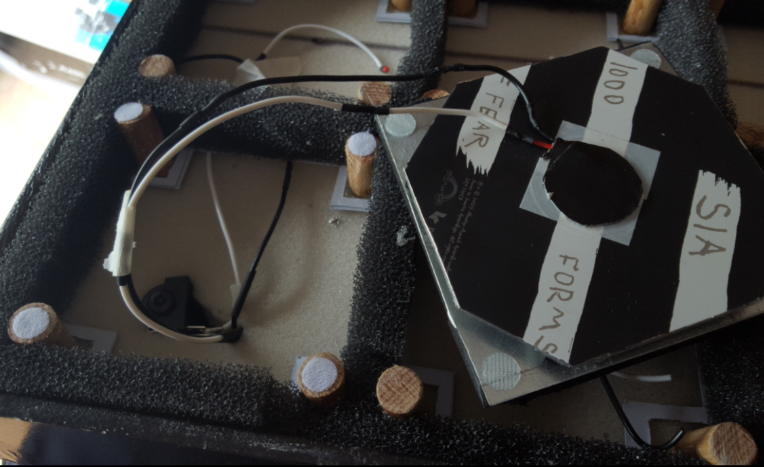 The card board is to give some structural strength to the black foam and to provide a little hole for each rod to operate in. Not sure I need that. We'll see. 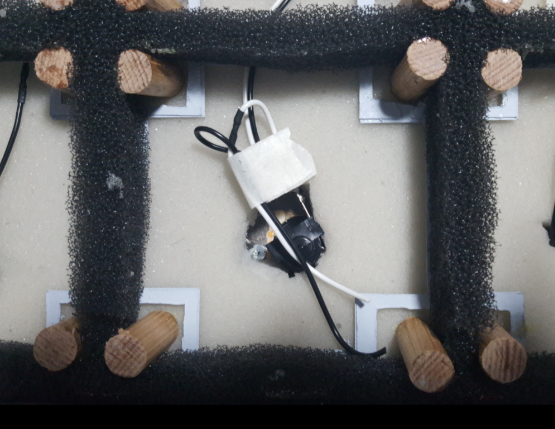 (edit: the project is finished now and I'm still not sure if I needed those cutout bits) The squares of yellow foam are just holding the dowel in place as the glue dries. 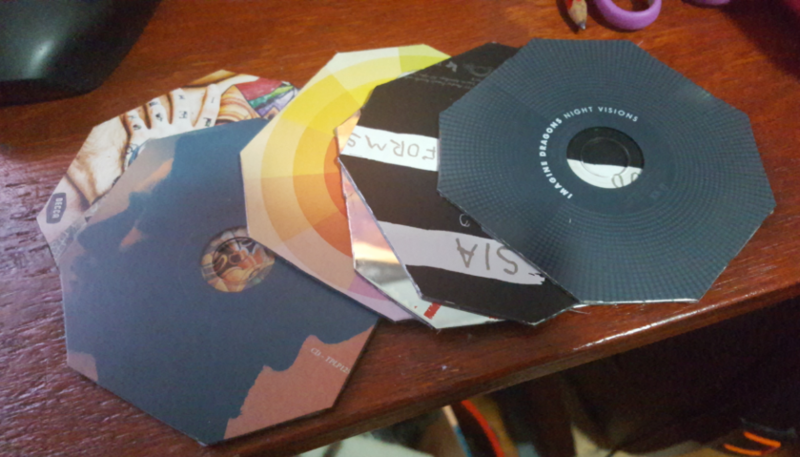 Now the MTMMMES Pad looks like this..
More in the next post. .
For the youngens out there they are called CDs. These days most people stream music or watch it for free on YouTube. But I digress.. 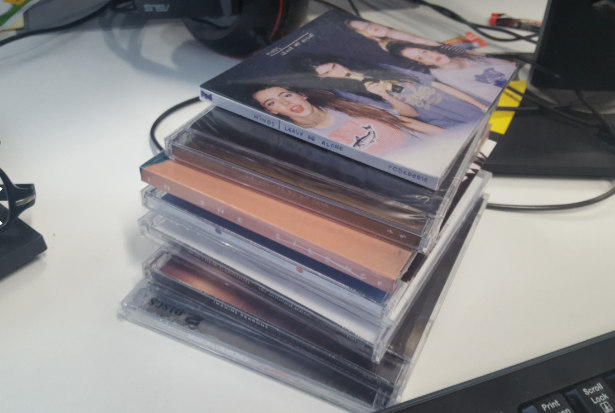 I don't play CDs so they are to become part of my MTMMMES V3 project.. <insert diabolical laughter>. 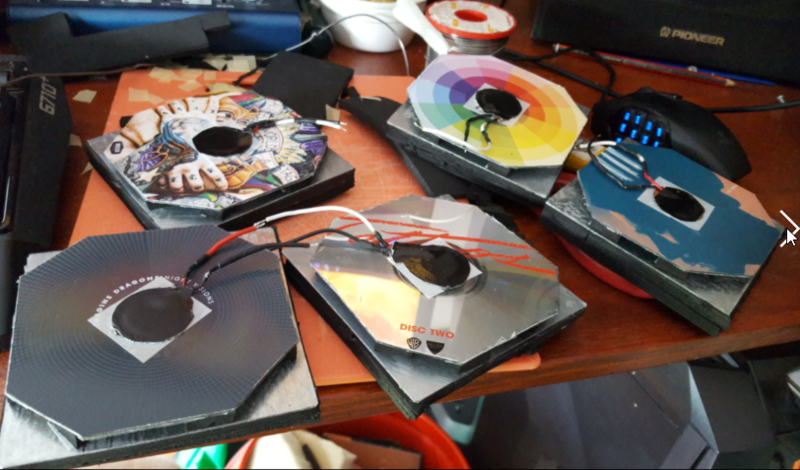 To each a used my favorite double sided tape to add a piezo to each of the 6. 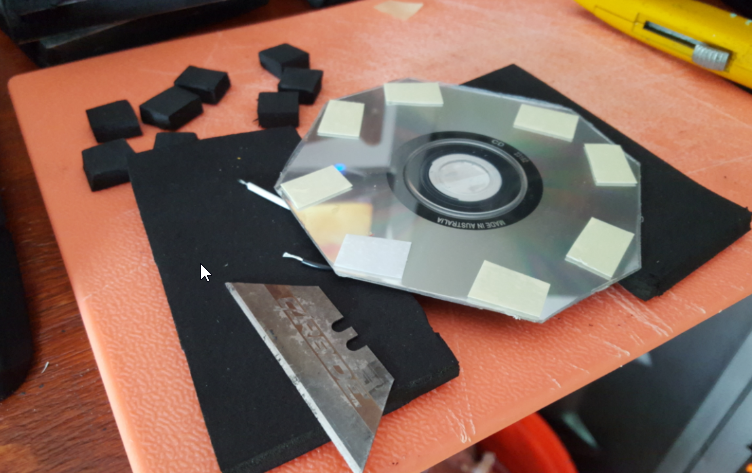 Next I cut out little squares of rubber and added some double sided tape all around each cd. Done it looked like this, with tape added ready to stick it to the metal plate. 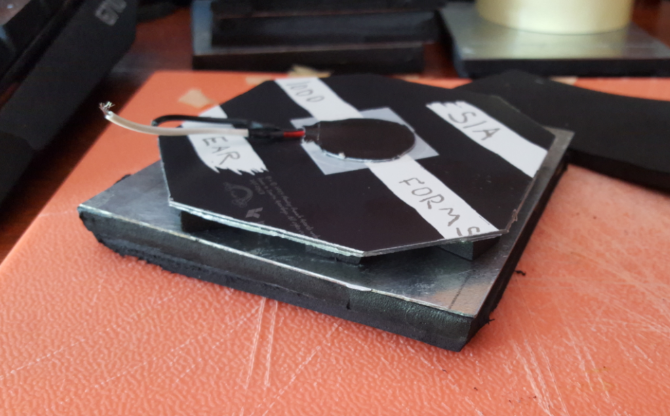 The metal plate has around 12mm or rubber glued to it with contact adhesive. I tried if first with 6mm but on hard hits i could hit the metal. 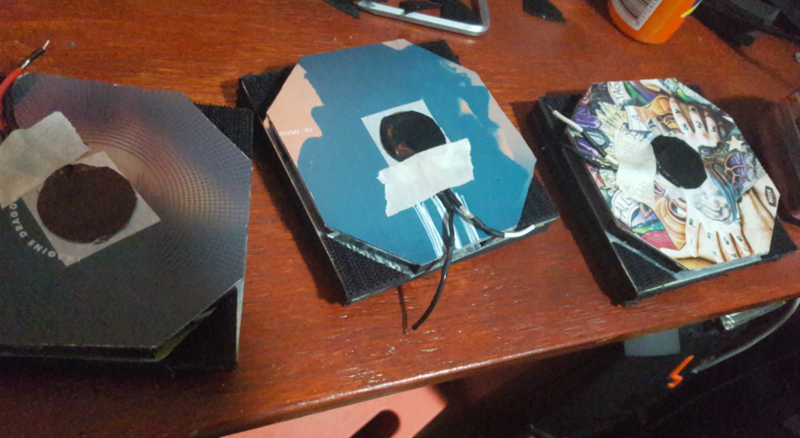 Here is 5 of them done waiting to be installed. While they were waiting I was installing Sia. Those little white pads are velco.. "Perfect" I thought last week when I spotted this set of velcro pads with self adhesive.. These velcro pads are rubbish. 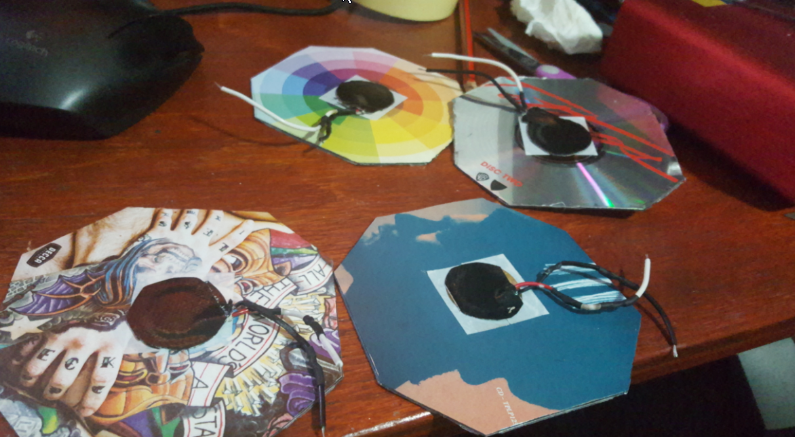 They are weak, flimsy and suited to school projects where you want to stick a removable image to a piece of cardboard, but I digress.. I needed better velcro. 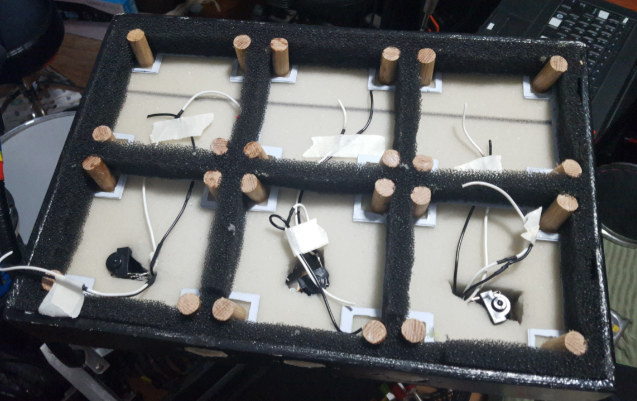 and i used contact adhesive to add the hooky bit of the velcro to each corner of each pad. 24 of them. 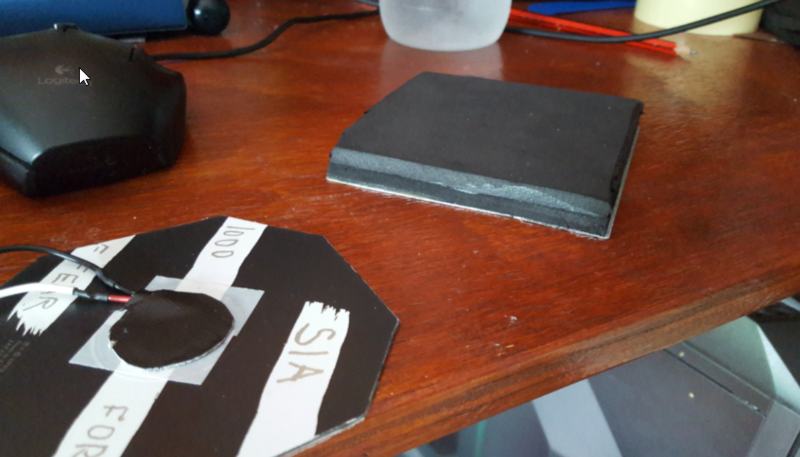 I gottta say here, there nothing in the world stickier than a small piece of velcro with a thin layer of contact adhesive spread over it's back. Putting then down on the table was comical and took several minutes in some cases. At one point I had accidently picked up 5 of them stuck all over my hand. 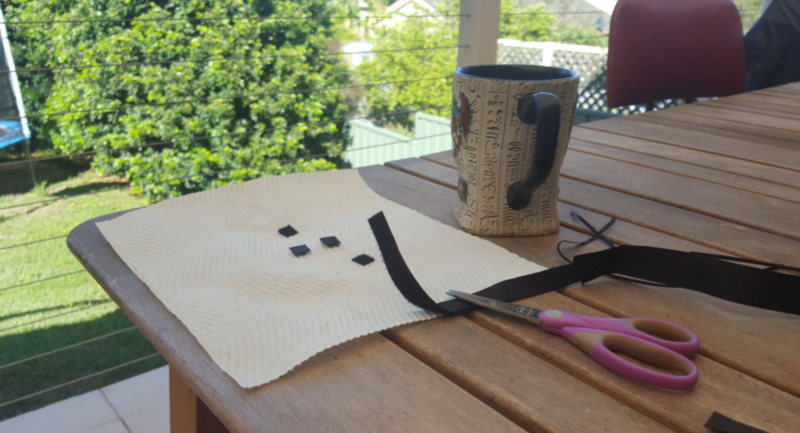 Whats better way to spend a sunny Sunday morning on the East Coast of Australia to have freshly brewed cup of coffee and cut out the other side of the velcro for the wooden posts. All done just a matter of adding all the pads. They stick great now. Here it is in action.. 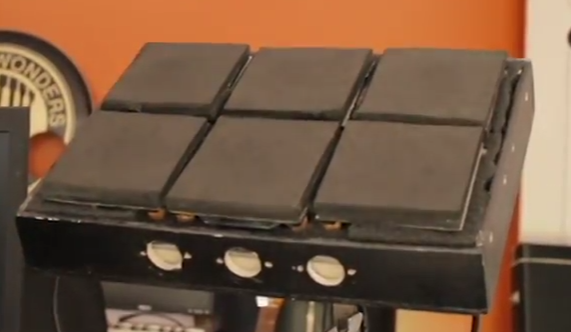 This is by far the best MTMMMES ( 'Mega-Twin' Modular Multipad Musical Expression System'.) to date. There is no hotspotting on the pads. Having the CDs doing something useful in 2018 really does the trick. 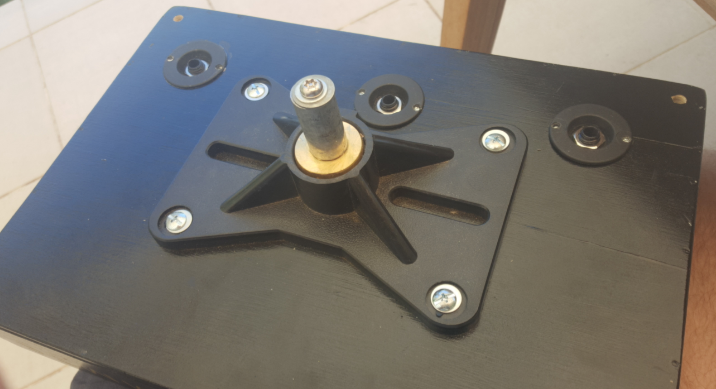 There was a little crosstalk but that is easily fixed but upping the velocity on the offending pad. For example if pad 2 fires when you hit Pad 1, just turn up the minimum velocity on Pad 2, From 0 - 127 to 60 - 127 or more I will never want to play super soft hits these pads anyway. They are primarily for single shots..
You're an Animal!!! That is too cool, Dobly! 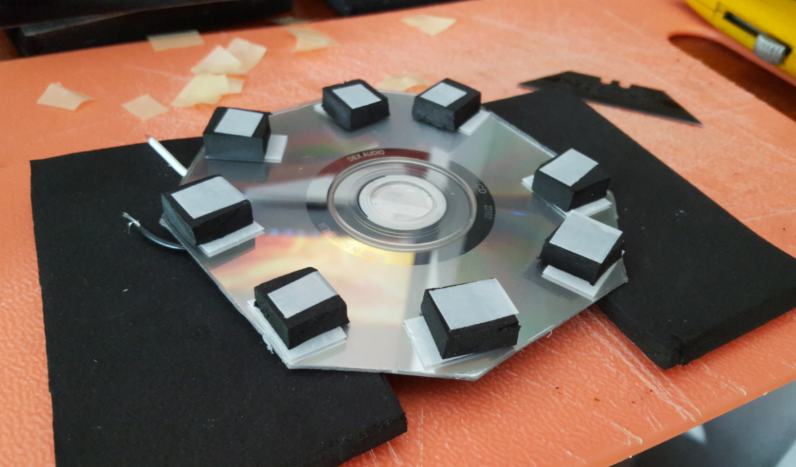 He is changing or fixing a Piezo in a mesh pad, sees the plastic reaction mount for the transducer and thinks to himself: Woah... just like a fricken CD!! !